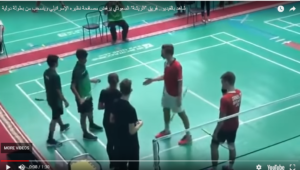 UK Lawyers for Israel has asked for an investigation to be carried out regarding the discrimination by Saudi players in a recent badminton game with an Israeli. UKLFI has written to the Badminton World Federation (BWF) about the Badminton event which took place on 1-4 August 2018 in Dnipro, Ukraine. In a doubles match at this event, Saudi Arabian players, who were drawn against an Israeli and a Ukrainian player, refused to play or engage in any way with their opponents. Max Grinblatt, an Israeli player, and his Ukranian doubles partner were due to play two players from Saudi Arabia in the semi-final on 3 August 2018 at the BWF sanctioned Forza Junior International in Ukraine. The Saudi players arrived on court, in their kit and ready to play, and took part in the coin toss. The match was therefore in progress. At this point the Saudi players refused to shake hands with their opponents and walked off court. This was all captured on video, a copy of which was given to the Saudi media. That video can be viewed HERE. As a result the match was forfeited to the Ukrainian-Israeli pair. UKLFI has pointed out that the action of the Saudi players breached numerous provisions of the BWF rules, which they have listed in detail. UKLFI has also drawn attention to the responsibilities of the Saudi Badminton Committee. UKLFI has requested that BWF should conduct a full investigation of the incident and the breaches. A copy of UKLFI’s letter to BWF is available here: letter to Badminton World Federation 23.9.18. Were you already aware of this incident? Has an investigation or disciplinary process been initiated? If yes, has it been completed and has the outcome been announced? Has there been any action taken against the Saudi players, coach or SBC? If not, can you assure us that an investigation and disciplinary process will be commenced? Please inform us of the nature and timescale of any planned investigation and/or disciplinary process. UKLFI awaits BWF’s response before making a complaint to the International Olympic Committee regarding the discrimination displayed by the Saudi players in this tournament.